Create USB Drives with Read Only Partitions and hard coded serial numbers. 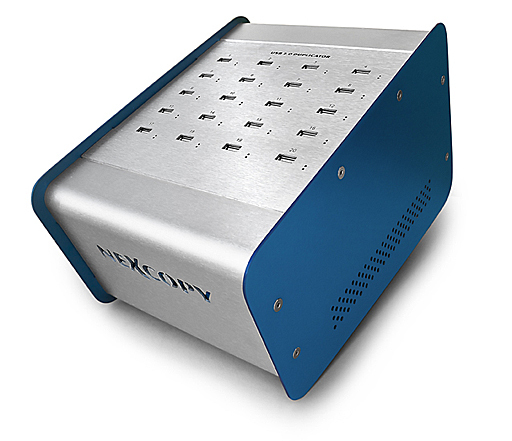 Media Supply introduces the Nexcopy Professional Series USB Duplicator with CD-ROM, Read Only and Partition features for advanced USB data loading requirements: the USB200PRO. With advanced copy features, small foot print and simple operation, the USB200PRO is an economical solution for creating CD-ROM and Read Only USB flash drives. Download the USB200PRO product brochure. Why do you need on-site USB CD-ROM and USB Read Only creation and data loading? Security. It's the most important issue with companies today. USB200PRO users can data lock their intellectual property to a USB CDROM or USB Read Only partition so the content cannot be deleted or formatted off the drive. Audit. USB200PRO users have control of the device serial number. This is a hard-coded serial number that cannot be changed or manipulated and is ideal for software distribution via USB flash drives. Users an set up Vendor ID and Product ID serial sequences as well. The USB200PRO is part of Nexcopy's flagship Professional product line, with advanced software features designed to create USB flash drives that are sustainable business products. The USB200PRO includes all the features of the USB200PC Series, and in addition, the USB200PRO has the ability for USB CDROM and USB Read Only (USB Write Protection) creation. To learn more about the USB200PRO and required USB media, please contact Media Supply at 1-800-944-4237. The USB200PRO does require specific USB media, and these functions cannot be performed on "just any flash drive" so contact us about USB media available for the USB200Pro.